With Christmas just around the corner, there's not much time left to make all of those cards. But cards don't always have to be about stockings and Santa Claus to have that Christmas feel. In this article I will show you how to make three beautiful Christmas cards with no Santas and in less than half an hour. These cards were created using papers from the Chatterbox Powder Room Paper collection (Powder Burgundy Cardstock, the underside of Powder Scarlet Puffs paper, Powder Lollipop Stripe paper, Powder Bubbles paper, a red and green card from Bazzill Christmas Cards (you could make your own card from red and green Bazzill cardstock), red ink, red glitter pen, silver pen, miscellaneous Christmas sticker and American Traditional Christmas Cheer Embossed stickers. 1. Cut a piece from the top left corner of Powder Burgundy Cardstock measuring 15cm by 20.6cm. Keep in mind that when you fold it in half, you want a large red flower to be centred on the front. 2. Fold the card in half and ink the edges with red ink. 3. Cut a strip of Powder Lollipop Stripe paper approximately 1cm tall and adhere across the front of your card, towards the bottom. Embellish by placing a miscellaneous Christmas sticker on the right side of the stripe. 4. 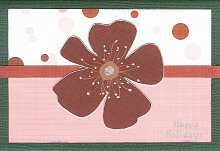 Finally, use a red glitter pen or silver pen to embellish the large red flower in the centre of your card. 1. Cut a piece of Powder Bubbles paper measuring approximately 13.8cm by 5cm. Ink the edges with red ink. Place your green card horizontally and adhere the piece towards the top of the front. 2. Cut a piece of the underside of Powder Scarlet Puffs paper measuring approximately 13.8cm by 5cm. Ink the edges with red ink. Adhere towards the bottom of the card (it will overlap the bubbles paper). 3. Cut a thin strip from the underside of Powder Lollipop Stripe paper approximately 1cm tall and adhere across the join between the two papers. 4. 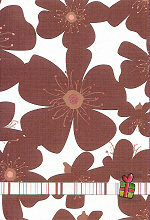 Cut a large red flower from Powder Burgundy Cardstock and adhere to the front of the card. Outline and embellish it with a silver pen. If you wish, you can also use your silver pen to write a holiday message like 'Happy Holidays' or 'Merry Christmas' in the bottom right corner of the card. 1. Cut a piece measuring approximately 9.8cm by 14.5cm from the underside of Powder Burgundy Cardstock. Ink the edges with red ink and adhere to the front of your card. 2. Cut a piece of Powder Bubbles paper measuring approximately 6cm by 9cm. 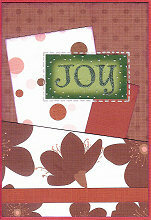 Ink the edges with red ink and adhere at an angle to the front of your card (see card above for placement). 3. Cut a piece from the underside of Powder Lollipop Stripe paper measuring approximately 3cm by 6cm. Ink the edges with red ink and adhere at the opposite angle to the front of your card (see card above for placement). 4. Cut a piece of Powder Burgundy Cardstock measuring approximately 9.8cm by 6.5cm. Cut the top edge at an angle, as shown above. Ink the edges with red ink and adhere to the bottom edge of your card, as shown above. 5. Cut a strip from the underside of Powder Lollipop Stripe paper approximately 1cm and adhere across your card, towards the bottom edge. 6. Finally, place your 'Joy' sticker from American Traditional Christmas Cheer Embossed stickers on your card (see picture above for exact placement) and draw a border around it with your silver pen. Voila! Three easy Christmas cards that your friends and family will love!